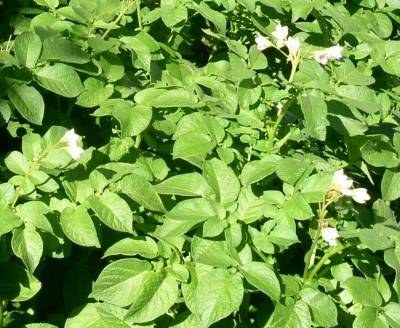 When flowers appear on the potato plants, start looking for new potatoes. We have been growing potatoes very successfully for several years and for us, potatoes have become one of the few special vegetables that we plant every year in our limited garden space. Why bother spending valuable garden space growing potatoes you ask? Then you confirm my suspicion that most people don’t know how good freshly dug potatoes are. Not to mention these potatoes were never sprayed with pesticides or herbicides. 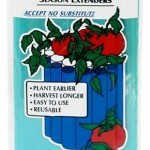 A good rule of thumb is each pound of seed potatoes will plant a 10 foot row with plants spaced one foot apart. Each piece of potato should be about the size of a chicken egg and have two or three eyes. If the seed potato is about the size of an egg, do not cut it, but plant it whole. Planting larger pieces will get each plant off to a faster start because more energy is available to the new plant, but it will also cost more to plant the potato patch. Last year’s potato patch was planted mostly with left over red potatoes from the previous year’s harvest, but we also bought a couple of pounds of new Yukon Gold seed potatoes to try them out as well. I noticed that different varieties of potatoes have more or less eyes. The red potatoes have many eyes, but the Yukon Gold potatoes have only a few eyes. So it is easier to cut red potatoes to get an even number of eyes and to get the size I wanted to plant. The Yukon Gold potatoes we planted have few eyes, so even some large potatoes could not be cut in half. To plant, simply lay the whole or cut potato in or on the soil with most of the eyes pointed up. 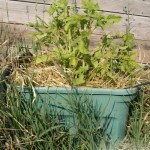 Cover with several inches of light soil or straw. Space the potatoes about one foot apart. We plant in raised beds and try to pack as many plants in as possible. We try never to step into a raised bed except onto stepping stones that are placed for that purpose. Since we do not need room to walk or to till between rows, the rows are also spaced one foot apart. Last year, we planted potatoes in an 8 x 8 foot (64 square foot) bed and only left four places to step in the bed, so about 60 potatoes were planted in the 64 square feet. 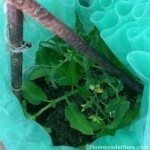 If you have limited space, read our post on how to grow potatoes in a container. After the potatoes sprout, we mulch them with a layer of straw. This keeps weeding down, except for the remaining oat or wheat seeds that sprout. It also keeps the soil cool and moist. It also reduces the number of potatoes that turn green because they were in the sunshine. 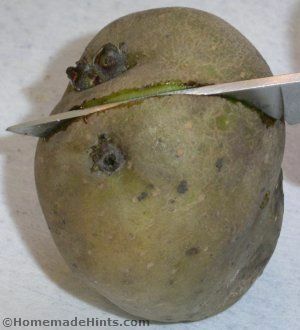 Note: Do not eat the green peel on a potato from your garden or from the grocery store. Peel all the green off the potato. Sometimes, the potatoes are actually found growing in the straw and not in the soil and now, some people are growing potatoes in straw instead of soil, by placing seed potatoes on top of the soil and covering with straw. New potatoes can be harvested as soon as you see you have potatoes big enough to pick. When you see flowers on the potato plants, it will be time. You can continue harvesting new potatoes until the tops of the plants start to die or are killed by frost. Pick a cool dry day if possible to harvest in the Fall. 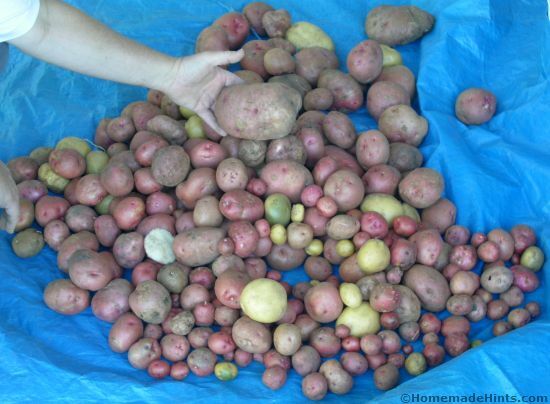 Simply pull or dig the potatoes up and leave them to dry, so most of the dirt will fall off. Be gentile. The less bumping and grinding the less bruising. If you injure or cut any of the potatoes during harvest, they will heal, but still best to eat them. My grandfather had a potato fork just for harvesting potatoes. It is the perfect tool,the potato fork digs down deep, lifts the potatoes into the air and allows the dirt to fall out of the way. I can’t justify buying a “unitasker” just to harvest our small patch, so I dig them buy hand with a small three-pronged digging tool and carefully use a shovel when necessary. So, how many potatoes can you expect to harvest from a potato patch? I read that commercial potato growers in the top four potato producing states planted 656,000 acres and harvested 29.5 billion pounds, so that is almost 45,000 pounds per acre, or if my math is correct, that is 1.03 lbs per square foot. A small intensively managed garden should easily match amount. I’m just not sure where I would keep 45,000 lbs of potatoes. Our potato harvest from a 64 square foot raised bed. This does not include all the new potatoes that had already been eaten. But seriously, we didn’t weigh our potatoes, but we estimated the final harvest at 60-70 lbs. Since we removed at least 10 lbs of new potatoes, the total harvest would be 70 – 80 lbs, so in 64 square feet, that is (1.09 – 1.25 lbs per sq foot). So for a few dollars for the cost of seed potatoes, you can expect a harvest of 8-15 pounds for every pound of seed potatoes. We planted about 7 – 8 lbs of seed potatoes and harvested 70 – 80 lbs of potatoes, which is exactly a 10:1 ratio. Not bad for home grown potatoes that were never sprayed with pesticides or herbicides. Store the potatoes in a cool dry place. Last year, after harvesting, washing and allowing the potatoes to dry, we moved the entire crop to a dark corner in our unheated basement on a tarp. We spread them out on the tarp and also covered them with the same tarp to keep them in the dark. We harvested in October and the red potatoes were still excellent well into March. The few Yukon Golds were in even better shape, but most were eaten by then. Remember, potatoes are still living, so they need air. It is not necessary to spread them out in a single layer, but do not pile them up too deep. 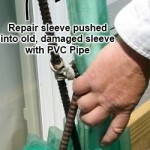 Generally, the cooler the better, 35-40°F is supposed to be the best storage temperature. Our basement is very cool, but does not get that cold until the winter. Under ideal conditions, potatoes can be stored for about 8 months before that start getting mushy. If your storage area is warmer, just try to eat your potatoes faster. But do not throw away mushy potatoes. They may not be nice to look at or may not be easy to peel and they contain mostly starches, but they are still good to eat. Everyone on the planet that eats tomatoes knows there is no comparison between homegrown tomatoes and those expensive, reddish, round things they try to pass off as tomatoes at the grocery store. The difference between homegrown potatoes and store-bought potatoes is not quite as dramatic as with tomatoes, but if you have never dug a fresh potato, you do not know what you are missing. We look forward to harvesting the first few new potatoes almost as much as the first tomato sandwich. A fresh, new potato has a very thin skin that is so delicate, you have to be careful not to rub off the skin when you wash them and the flesh of a fresh potato actually has flavor. We recommend steaming or roasting them. Simply add a little salt, pepper and butter to compliment, but not cover up the flavor. Notice I said butter and not margarine. As soon a potato has been dug up, it goes into survival mode and starts growing a thick skin to protect itself from dehydration. The flesh of the potato soon turns into a nearly 100% starch matrix and the only nutrients left in the potato are in the only active part of the tuber, which is the skin. So if you peel the potato, there are very few nutrients except for the calories from starch. That’s why we need to add so much salt, butter, sour cream and cheese to a potato. You can begin harvesting new potatoes as soon as you think they are large enough. Feel around under the plants just below the the mulch and soil and pick them off. The remaining potatoes will continue to grow, and you can continue to harvest new potatoes until you decide to harvest the remainder of the crop. So, until you dig up a a fresh potato and cook it yourself, your potato education will be incomplete. If you are already a fan of new potatoes or if you have never had a new potato, we hope this little pep talk will convince you to plant a small potato patch or at least plant a single potato in a container on the patio, just to see what you have been missing.